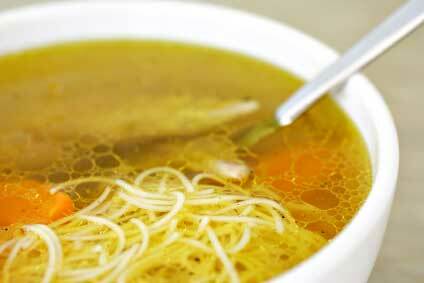 Wholesome CHICKEN NOODLE SOUP Recipe that's low carb. Ah, yes. Chicken noodle soup... the ultimate comfort food! I really insist on home made chicken stock when I make a chicken noodle soup recipe. And by the way, it really does help you get over a cold or flu. Next time you roast a whole chicken or turkey save the carcass. If you can’t use it right away, just freeze it. When it’s time to make the stock just toss it into the soup pot. Because I follow a low carb diet, I have replaced the usual pasta noodles with julienned zucchini. I've fallen in love with my hand held vegetable spiral cutter. You put your zucchini inside and then you push and turn the zucchini which then comes out in long continuous strands. Perfect "noodles". Start the stock in the morning or the night before. In a large saucepan, combine the carcass, water, bay leaf, celery and the onion. Bring to a boil, reduce the heat and simmer with the lid on for about 4 hours. Your house will smell so good!!! Remove the carcass and let cool. Strain the soup in a sieve, reserving the stock. Pick out and save any loose meat. Return the stock to the saucepan. Let the carcass cool enough to handle. Now remove all of the delicious meat clinging to it and add it to the stock. For the soup, bring the stock back to a boil. Add the veggies and herbs and simmer for another 15 minutes. Add the julienned zucchini and simmer them for about 5 minutes. That’s it. Now grab a mug and a soup spoon. Get your comforter and favorite book. Move the cat from your cherished spot on the couch and just pamper yourself and relax for a little while. Let’s go from the chicken noodle soup recipe page to the HOME page.